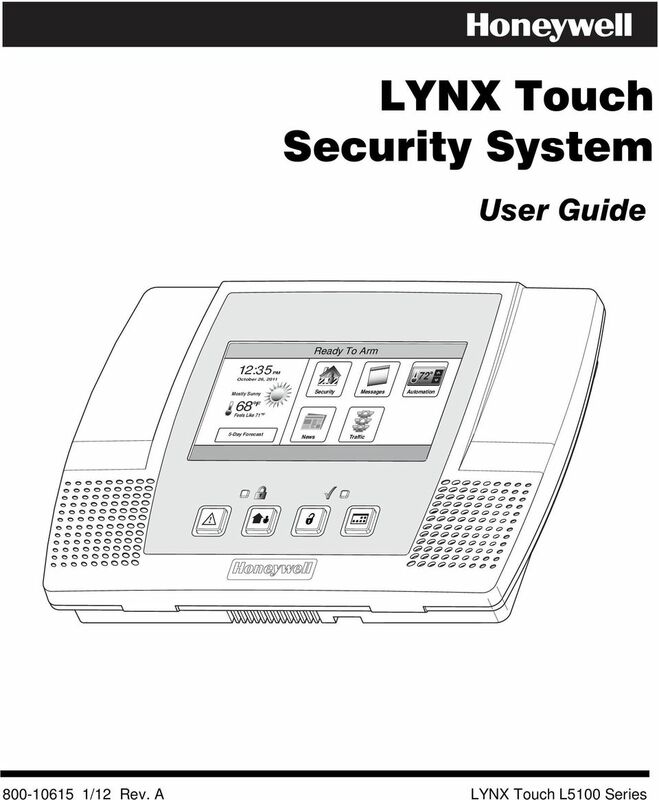 Download "LYNX Touch Security System"
5 5 SYSTEM OVERVIEW Features General Information This system offers you three forms of protection: burglary, fire, and emergency, depending on the configuration of your system. 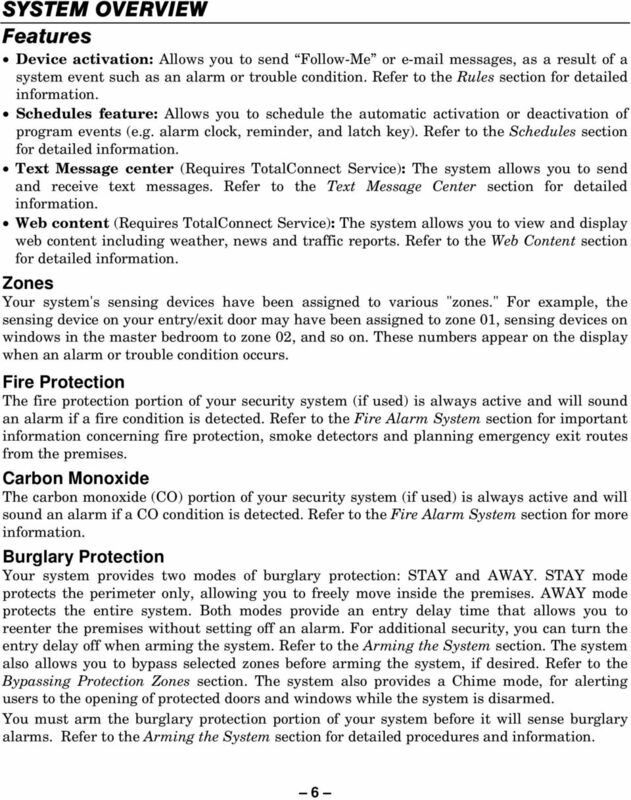 The system consists of a touch screen control for system operation, various wireless sensors that provide perimeter and interior burglary protection, and optional smoke or combustion detectors to provide early fire warning. In addition, optional wireless keypads or key fobs may have been installed to allow you to control the system away from the touch screen control. The system may also be used as a speaker phone. 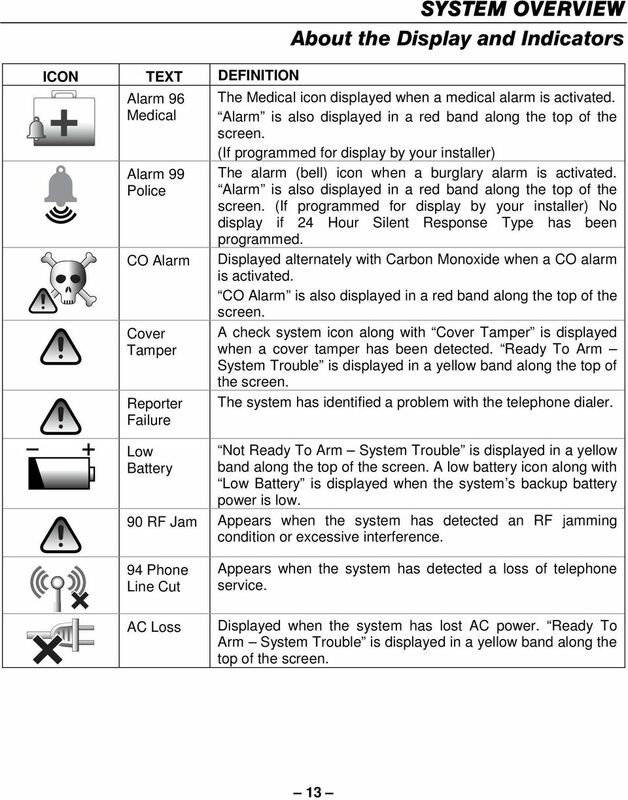 The system monitors protection zones and system status, displays appropriate information on the touch screen display, and initiates appropriate alarms. 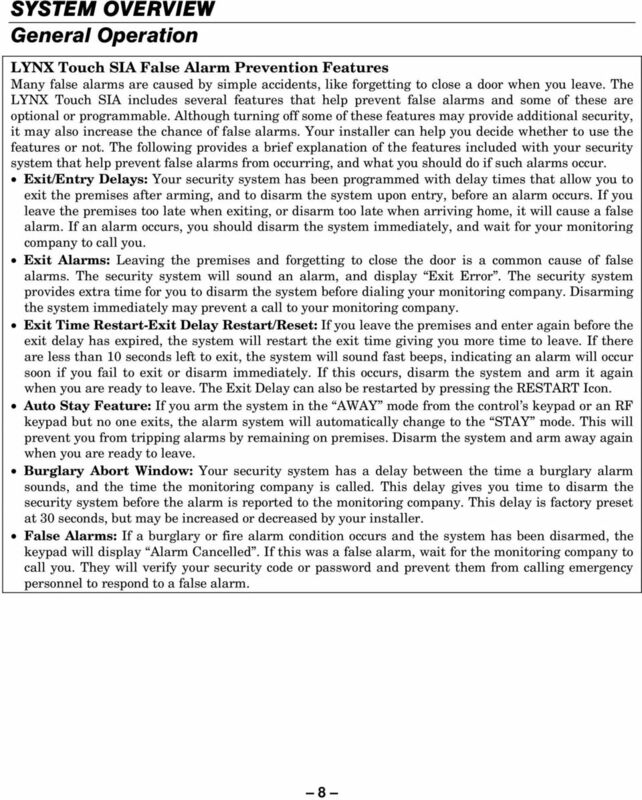 Your system may also have been programmed to automatically send alarm or status messages over the phone lines or via the cellular/gsm network or the internet to a central alarm monitoring station, and may also be capable of two-way voice communication with the central station. IMPORTANT SECURITY NOTICE Your key fob is similar to your keys or access card. If lost or stolen, another person can compromise your security system. Immediately notify your Dealer/Installer of a lost or stolen key fob. The Dealer/Installer will then remove the key fob programming from the security system. 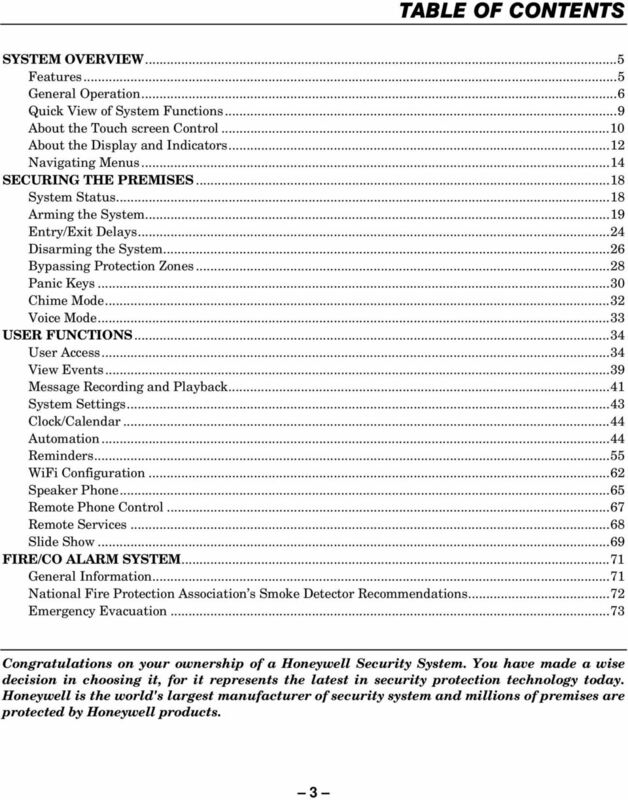 The user features of this security system are listed below. 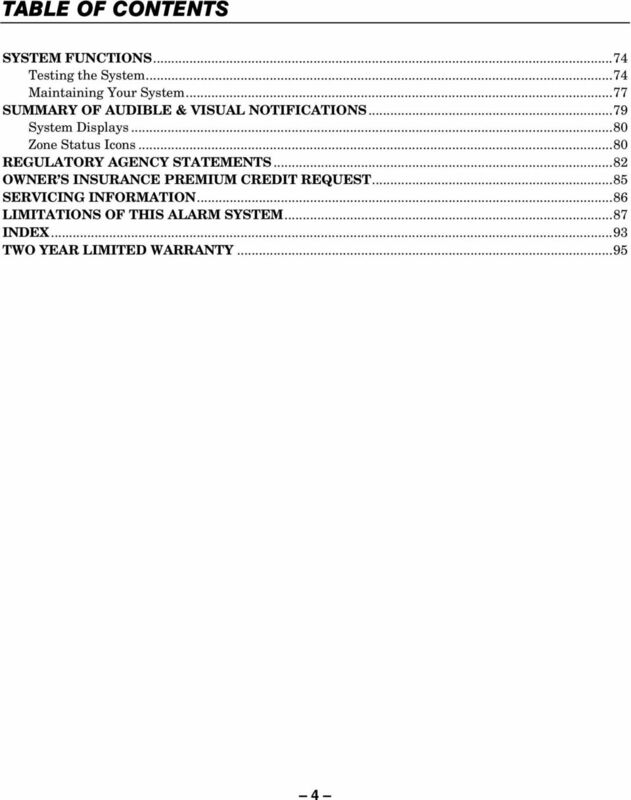 Ask your installer which features have been programmed for your system. 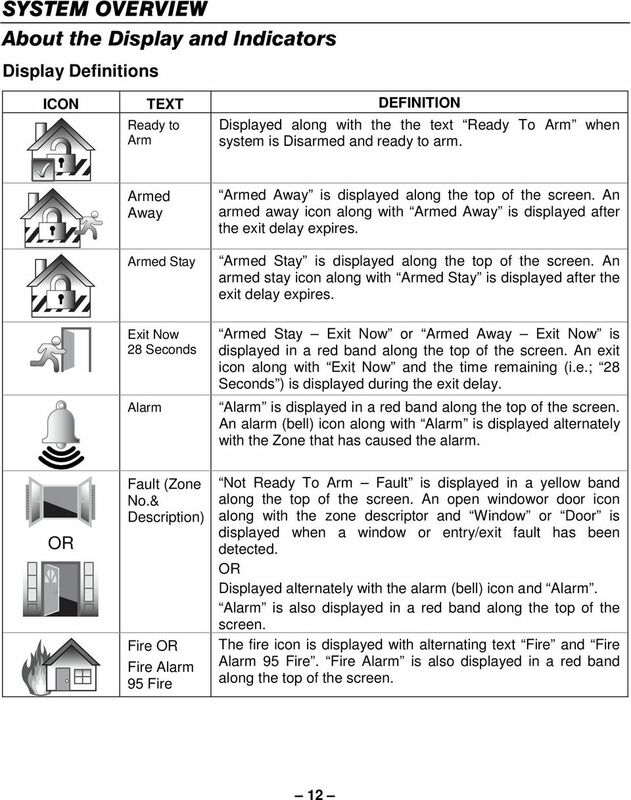 Stay and Away arming modes: By using these modes you can protect either the perimeter only, or the entire premises. 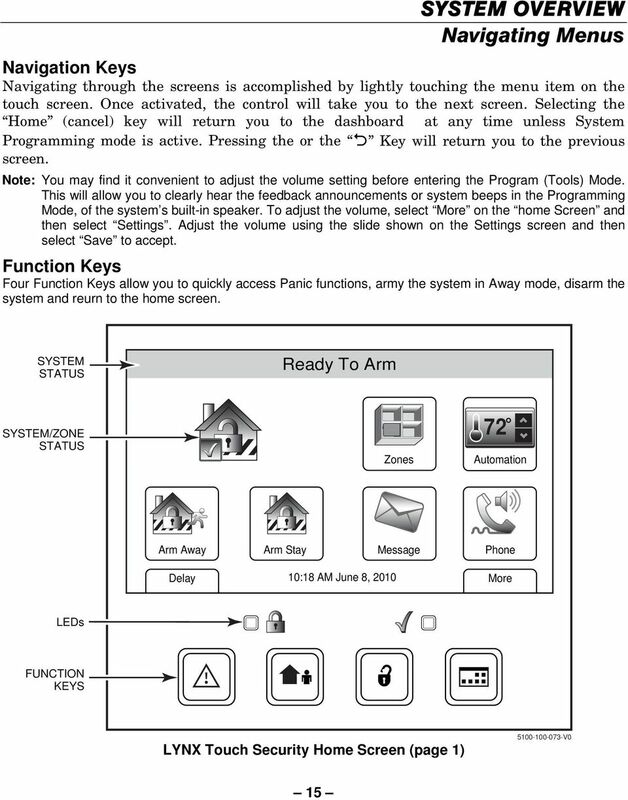 Panic key functions: A designated key allow you to manually activate fire, medical emergency, or silent police alarms. 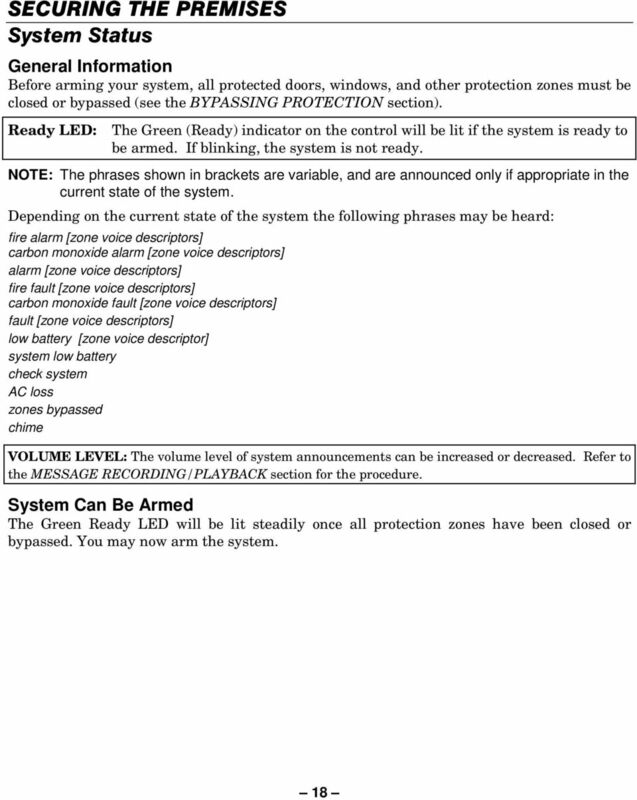 Refer to the Panic Keys section for detailed information. 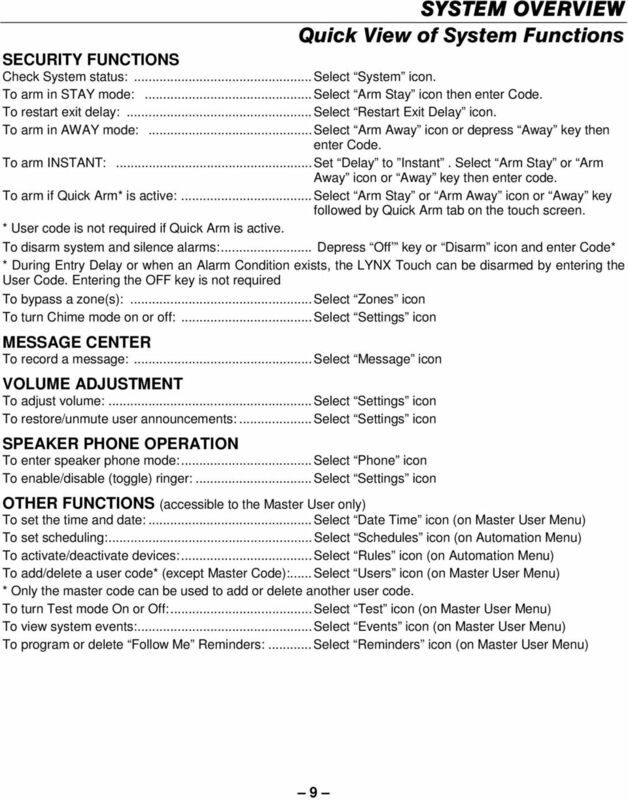 Follow me reminder announcements: Allows the panel to dial a number that you have specified, at a programmed day/time and deliver a message programmed by your installer. 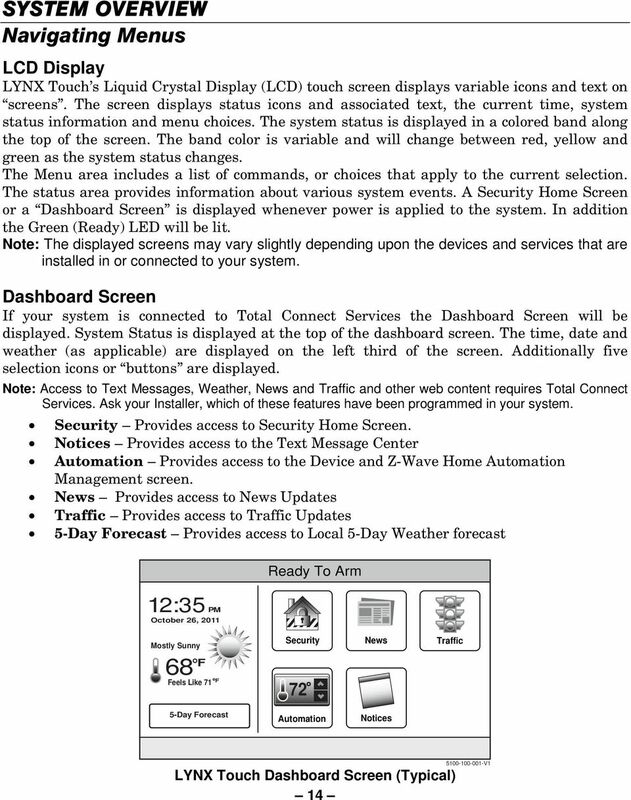 Real-time clock: Touch screen displays current date and time. Refer to the Clock/Calendar section for procedures for setting the time. 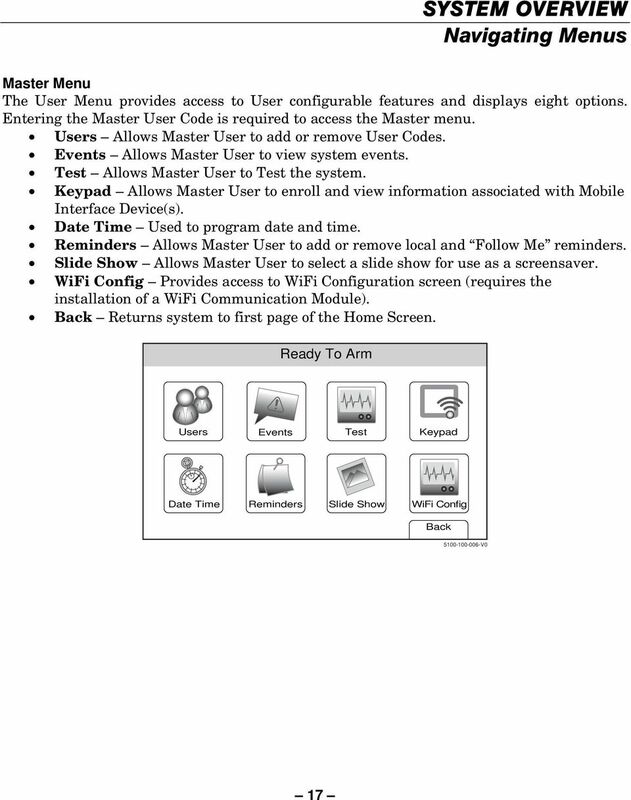 Message center: The system allows recording and play back of brief voice messages. Refer to the Recording/Playback Messages section for procedures. 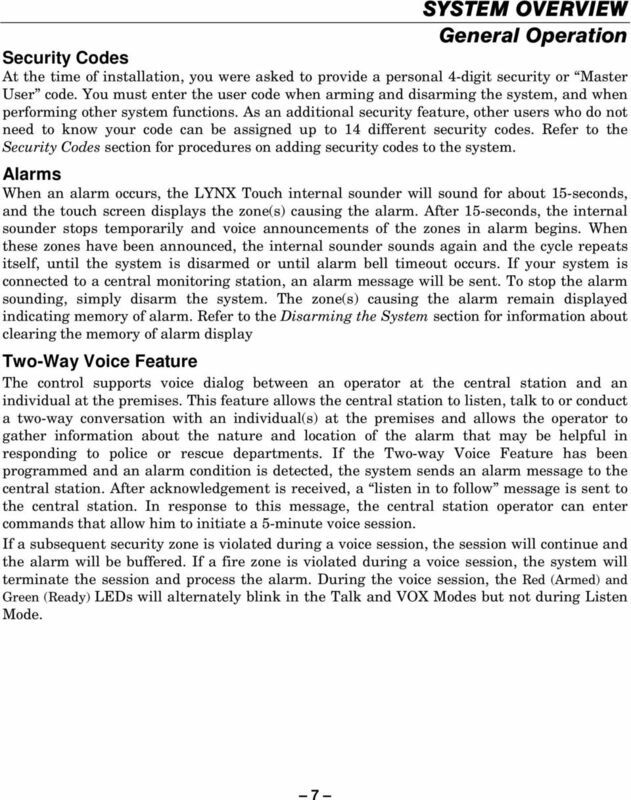 Two-way voice: Allows the central station to listen, talk to or conduct two-way conversations with individuals on the premises Refer to the Two-Way Voice section for detailed information. 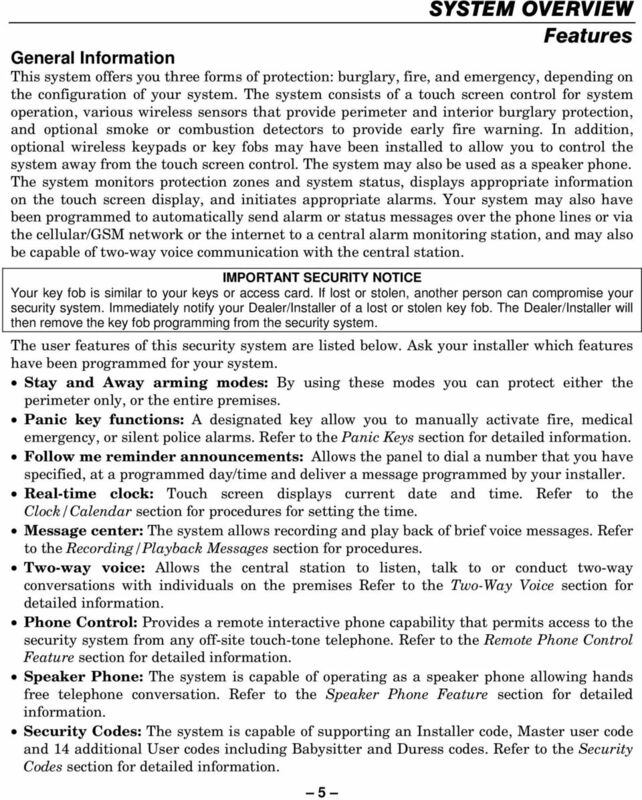 Phone Control: Provides a remote interactive phone capability that permits access to the security system from any off-site touch-tone telephone. 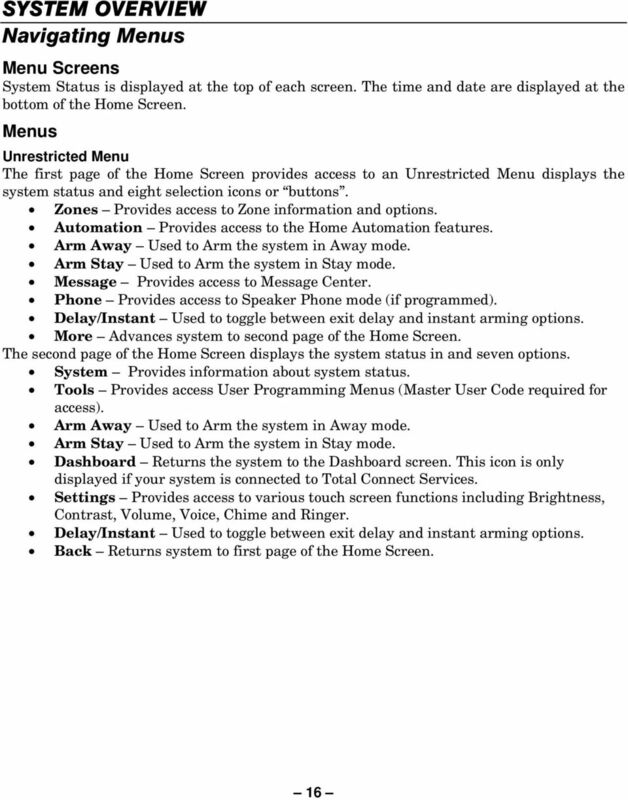 Refer to the Remote Phone Control Feature section for detailed information. Speaker Phone: The system is capable of operating as a speaker phone allowing hands free telephone conversation. 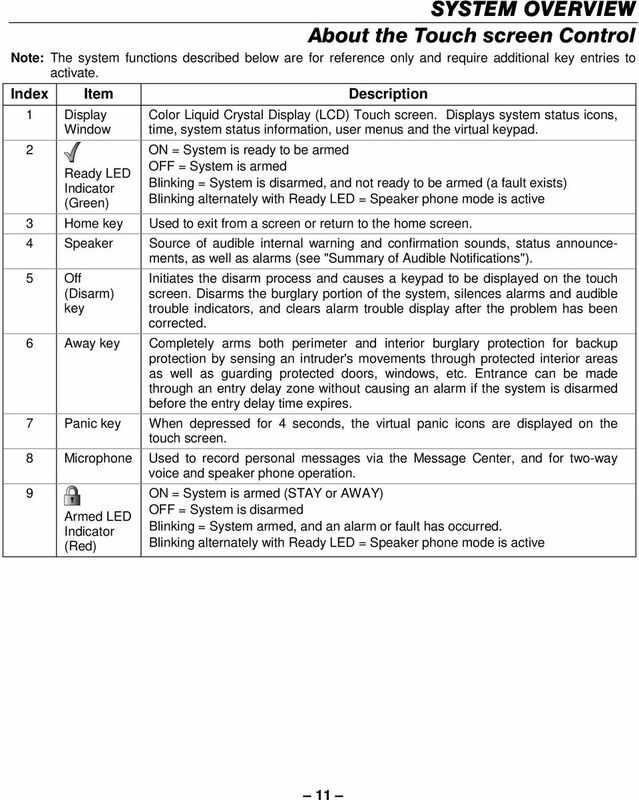 Refer to the Speaker Phone Feature section for detailed information. 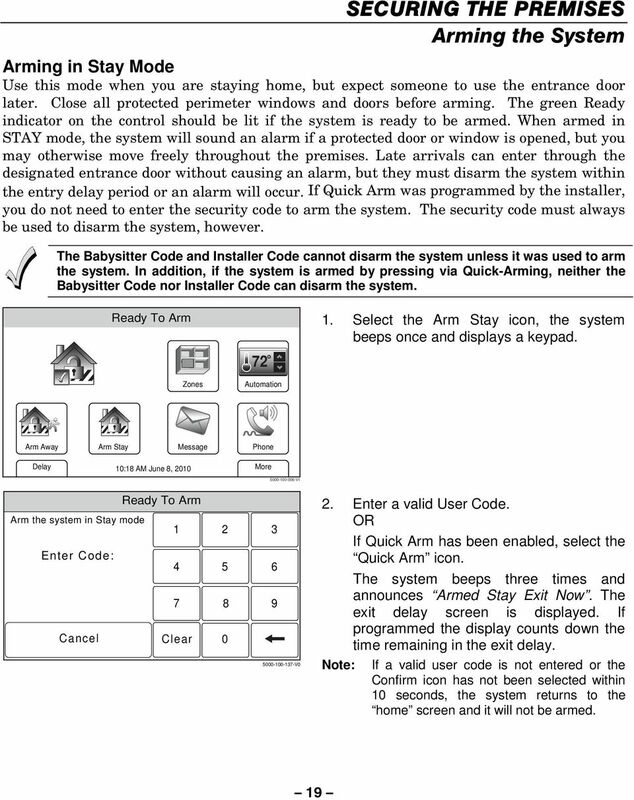 Security Codes: The system is capable of supporting an Installer code, Master user code and 14 additional User codes including Babysitter and Duress codes. 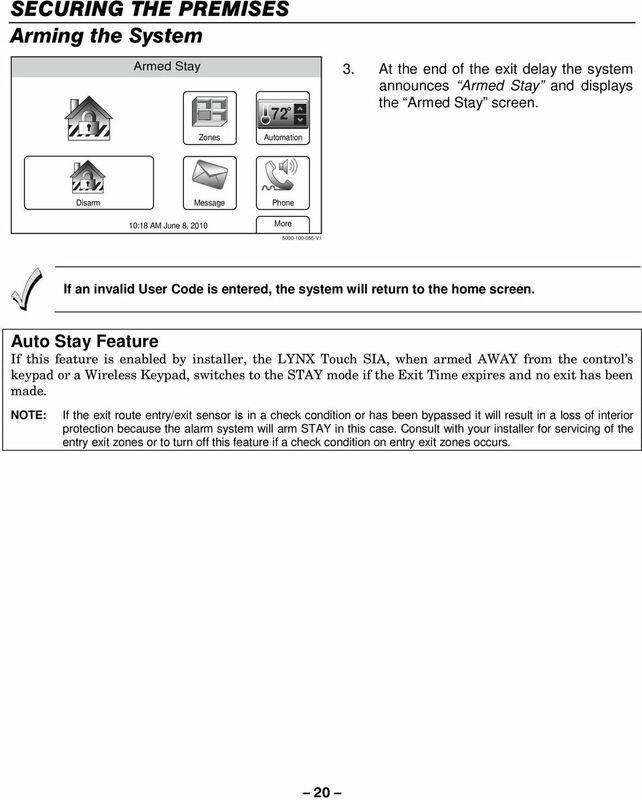 Refer to the Security Codes section for detailed information. Silencing an Alarm. 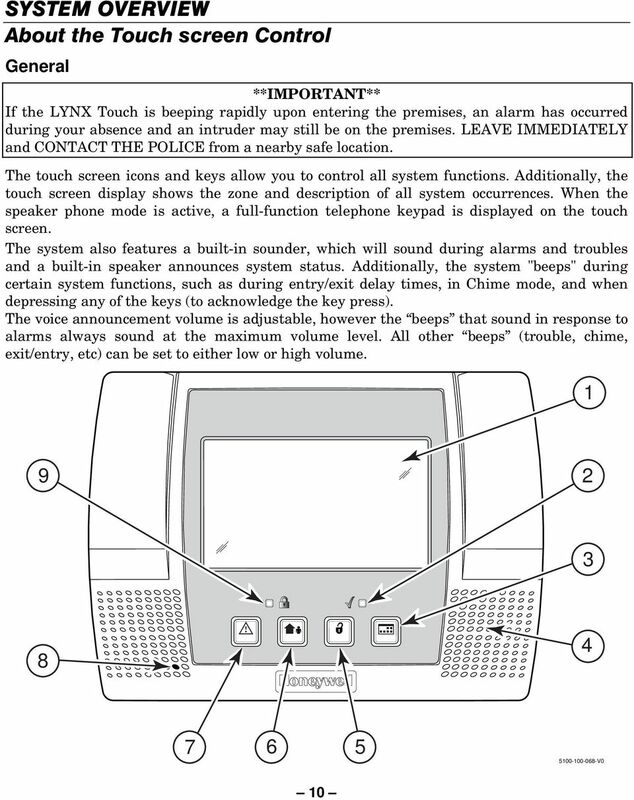 the alarm and send an Abort or Cancel message to the Central Station and the security system will be disarmed.